Control your on-board camera with your aircraft transmitter. Plug the controller to a switch channel of your receiver, then you can control the camera with the switch channel of your transmitter. * It requires your camera supports the IR control function (with IR receiver), also different brands cameras using different IR controllers, this is for Sony series cameras. 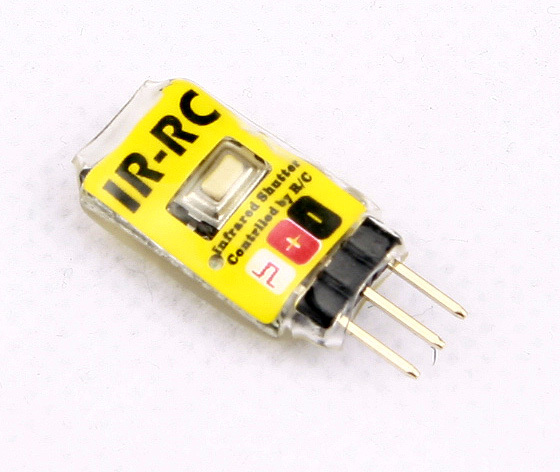 * Your camera should be set to IR control mode when use this device. G15 G9 G7 G6 G5 G3 G2 G1 S1is S70 S60 Pro90IS 300v 300x 3000vQD IXUS jr/Ⅱ/Ⅲetc. Pentax: K01 Kr Km Kx K7 K5 K10D K20D K30 K100D K110D K200D etc.